A Fun Fun Day for LZfamily! 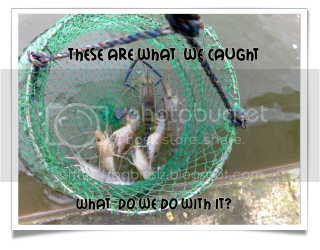 So what was it that we catch and eat? Prawns lor! Hahaha.... We have been out of the house since 11+am and didn't get home till 10+ pm! Weather was great! After prawning, we went to Ikea Tampines for dinner and went over to Giant Tampines. Call me a 'mountain tortise', I have never been to Giant @ Tampines and it is HUGE! My legs were aching like mad and so were LZ! I think we seriously need a break during weekend, I mean ME! Don't intend to write much and let the pics do the 'talking'! 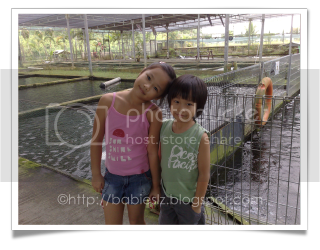 We walked around the fish farm before we went for prawning. Come, pose for mommy before we start! Both ready for prawning! We had the whole prawning section to ourselves! I was very happy to see both my babies spending time doing something different and it was another great way for family bonding. I don't think we can do this often when Beanie join us, maybe when he is older. 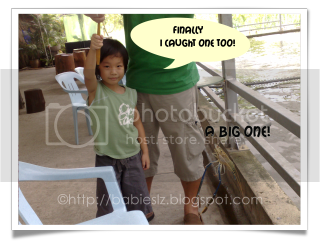 When Z saw jiejie caught one, he was disappointed that he didn't. Since I have the luck to catch it, I gave Z a helping hand and he caught one. 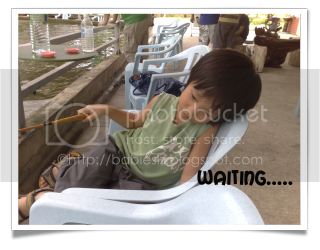 waited.... While waiting, we munched on snacks that I packed along. We were surprised that both were so patient to wait so long. 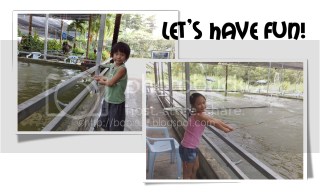 We planned to do 'fishing' for only 2 hours but Z requested for another hour coz he wanted to catch another one (which they did without our help ). We obliged coz we think it is good way to 'train' them to be patient. These were the catch of the day. 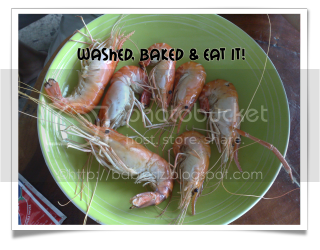 I thought it was very miserable to catch only 7 prawns.... Ok... At least they are big! Instead of bringing it back home, we baked it at the farm. We will definitely come back coz the prawns were bigger than those that we caught the last time and they have an oven and seasoning for our use! Gosh! 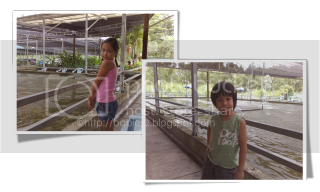 I just realised the last time we did prawning was in Oct 2006! 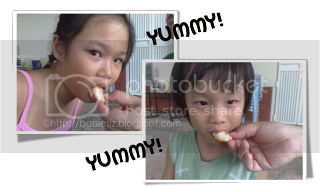 Savouring the prawns... I think it was exceptionally tasty coz they caught it. 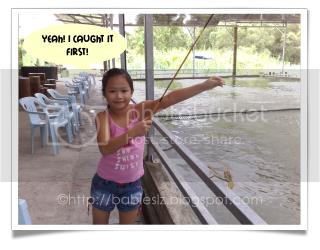 LZdaddy calculated and told us the prawns were expensive ok.. 3 hours and we caught only 7. 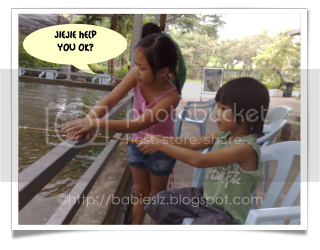 Besides prawn fishing, they have fish spa therapy too. Btw, I am not paid to advertise for them hor. Good thing must share right? Time passes so fast and Beanie is already 26 to 27 weeks. I am so blur that I am not sure if Beanie is 26 or 27 weeks. Hmmm.... What kind of mommy am I? Just when I thought Beanie is already 27 weeks and Doc told me he is 26+ weeks. Aiya... Never mind, so long Beanie is healthy! Today visit to the Doc's clinic was quite fast and short. This time I didn't put on as much weight! Yeah! I put on only 1.4 kg. Glad to know my blood pressure is ok too. Doc gave me my blood test result. Not so good.... My blood level was supposed to be at 12 (at least) but it was 11.1. I thought just a little difference was ok but I was wrong. It was the same as my previous 2 pregnancies. I have to eat more red meat and double my iron tablet. Actually, when I found out I was pregnant, I have been trying to eat as much red meat as possible but it is still not good enough. One down side of taking double irons would be I may have constipation. Doc would prefer my blood level to be higher, preferably at 14 when I deliver. You see, twice I lost lots of blood during delivery and I was 'stuck' in the delivery suite for hours. Those preggie mommies deliver at the same time as me or later were already back in their wards. This time, Doc said she will standby a kind of drug (can't remember what's the name) which is very expensive when I deliver. It is suppose to help my uterus to contract and to prevent me from losing too much blood. She said she will try not to use the drug on as she worried the result may be the opposite. LZ were excited about seeing Beanie and they looked intently at the screen during the scanning. Beanie was usual, sleeping when I did the scan. Seems like he sleeps a lot in the day. Oops! Doc checked on his spine, limbs and head and everything looks ok. Doc measured his head circumference and it is 28cm. I asked the same question again, am I going to have another big head baby again? She said looks like it! One of our concerns was if I would deliver early.... I have yet to get anything ready for Beanie! Doc laughed and said this is a 3rd child syndrome! I feel so bad.... I would love to get things ready early but have been feeling very tired. She said based on my past 2 pregnancies, my babies like to come out late and I will be able to enjoy the Chinese New Goodies. She warned me not to eat too much of the CNY goodies as they are not healthy at all. But I think I will take it that Beanie will come out early so that I will get things ready as well. LZ have been asking me to set up the Christmas tree. 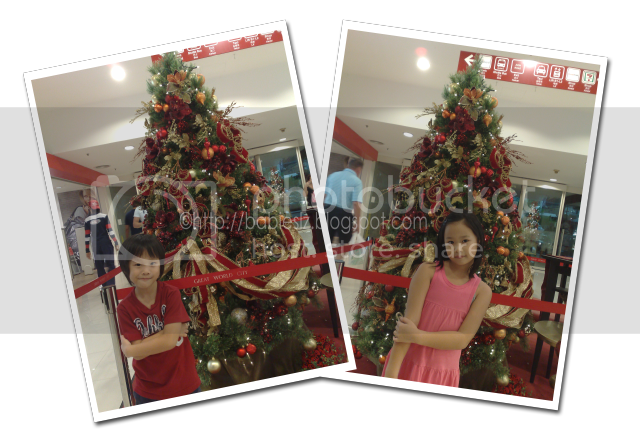 Since I have been lazy, let them take pic with the one at the mall first. This morning, all of us woke up early to get L's P2 textbooks, worried that they may be long queue. To my surprise , there was no one at the bookshop (in school) at all! 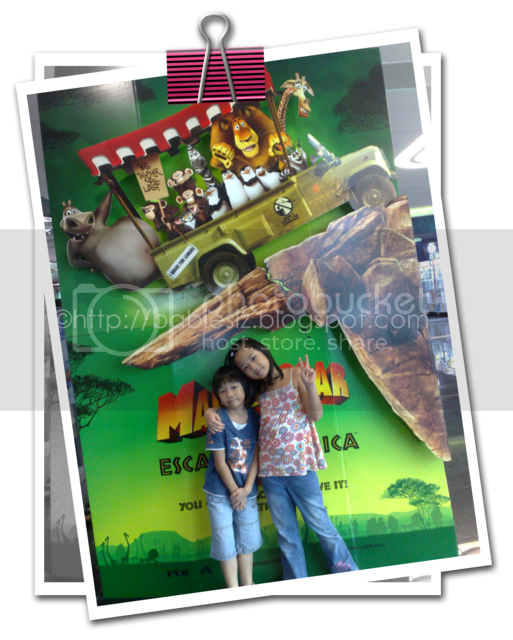 We had early lunch and brought the kids to watch the movie, Madagascar 2 (you can find games here). To me, the first movie was better than this one but who cares, so long my babies enjoyed it. 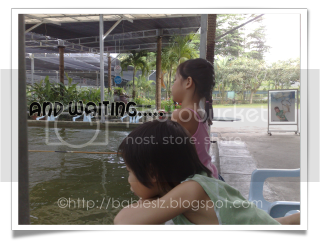 In the evening, they went for their classes as usual and LZdaddy went back to camp (reservist). Oh man! 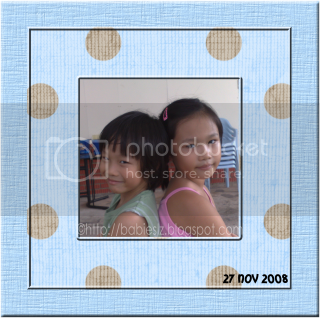 I feel so tired.... Just a day of outing and sending them for classes and I ached all over. I was already aching all over when we had dinner, queuing to buy food for LZ and myself, then the fetching and sending them to different place for their lessons (though walking distance). It was worst when I had to climb more than 4 flight of stairs to send L for her ballet lesson! As soon as we got home, L turned on the heater, Z cleared his bag. When they took their shower, I had no choice but to get up coz Z pooed... I had to wash his buttock. LZ hurried me to go back to my bed. Thereafter, they took a quick shower and went to bed. All the while, L reminded didi to hurry up and must sleep early so I can rest. Half hour later when I checked on them, they are already sleeping. LZdaddy called to check on us and I told him about our babies... He was very touched too and told me to blog about this. After talking to him, I found myself tearing... I thank GOD for giving me such wonderful children and a thoughtful hubby... I must appreciate what GOD has given me. Of coz there are times they drive me up the wall but at times like these, they are so well behaved. Haven't been doing much lately with LZ.... That doesn't mean they have been very quiet at home. They kept themselves busy with artworks, ideas from L or books, they read many books, computer games and their tamagotchis. 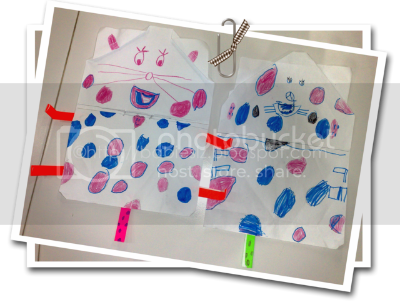 Left is a cat done by L and on the right is a dog done by Z. This is one of the artworks that they did which I like very much, though not like any artwork taught by professional. This also the one that they love too. Initially, Z was pretty upset coz he said his doesn't really look like a dog and he lost all the legs (that was supposed to stick to the side). So I suggested drawing some whiskers and the legs. Finally I see smile on his face again. Hmmm.... I think L should be a teacher or an art teacher, she definitely show interest in teaching the young ones, especially in art. Would love to take pics of all their artworks but before I could do it, they have already damage most of it. Thank you Babies... It was very sweet of you two to do things on your own and let mommy have a good rest. ..... Dance so much that when we stop Z from coming down from his seat, he doesn't mind dancing seated down. Forgot to post this which I recorded on my birthday. LZdaddy has a few 'disco' songs in his hp just for our babies, so that as and when they feel like it, they turn it on. They dance a lot of times at home, as long as they hear music, they dance. They love it when they know both of us are looking at them and that it will make us laugh. At times, I laughed at the way he danced and honestly I don't think my boy is a good dancer. In fact, I think L is a very good dancer, probably coz she learns ballet. LZdaddy said "Don't play play huh! He may be a disco king some day." The Boy Did It Again! ARRGGGHHH!